Public officials are looking for some input on mountain biking trails in Kirkland and the Spruce Railroad Trail over on the Olympic Peninsula. Remember, if you don’t speak up now, you don’t really have a right to grouse later. 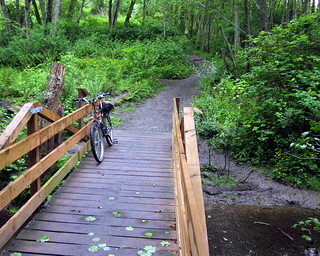 At left is a bridge over Denny Creek in Big Finn Hill Park. It was funded and built by the Evergreen Mountain Bike Alliance in cooperation with neighbors and the King County parks department. Now King County says it’s looking for guidance to create a “trails plan” on the 220-acre park adjacent to St. Edwards State Park. A public meeting is scheduled from 7-9 p.m. Thursday (June 7) at Finn Hill Middle School, 8040 NE 132nd St., Kirkland. The county staff will present the current status of the park, then find out about trail use and what trail improvements are needed. Currently, there are about 4 miles of twisty-turny trails in the park. They’re used by mountain bikers, but lots of folks in the neighborhood also use them for hiking or walking their dogs. The trail network at the park hooks up with Saint Edward State Park, which boasts about 7 miles of trails to the north. With the Discover Pass card now in effect at St Ed’s, I would guess that some mountain bikers are using the Big Finn parking lot and riding the labyrinth of trails to the state park. If you’re one of those people who like Big Finn Hill the way it is, you should probably show up too. The National Park Service is seeking input for its plan to improve the Spruce Railroad Trail on the north shore of Lake Crescent in the Olympic National Forest. The park plans to create a 10-1/2 foot wide, 3.5-mile long crushed gravel trail that would be accessible to bicyclists, as well as pedestrians, equestrians, and people in wheelchairs. Two historic railroad tunnels along the route would be reopened. The park service is seeking comments through Friday (June 8, 2012). Clallam County is building the Olympic Discovery Trail all the way from Port Townsend to LaPush, a distance of 130 miles. According to the Peninsula Daily News, the county want to join the Spruce Railroad Trail on the north side of Lake Crescent to help avoid the busy Highway 101 corridor on the south side of the lake. County officials are questioning the effectiveness of the crushed rock surface for narrow bicycle tires and wheelchair accessibility. They also want to see a 1.5-mile gap closed.